Beautifully crafted, high-end drums without the price tag. Lovely construction job. Excellent value for money. Walnut snare particularly impresses. Well suited to the majority of drum styles. On the fly adjustments are fiddly. Originally conceived as a percussion company back in 1958, Natal has combined its traditional conga and bongo building techniques with some serious drum kit know-how to create the original 'Stave' and 'Pure Stave' snare drum ranges. After taking a look at the Natal Pure Stave Walnut Snare in 2013, we now bring you the full collection of these British-made drums with a few extra size options and a whopping price reduction. Here we have all six varieties of Pure Stave snare drums. They are made up of maple, ash and walnut woods, each available in 14"x5½" and more recently, 14"x6½". All snares sport a natural wood fi nish, complete with a coating of natural beeswax to protect the outer layer and create a smooth fi nish - no lacquers or wraps in sight here. "The drums appear exceptionally well built, with an abundance of hefty chrome hardware adorning each shell"
The drums appear exceptionally well built, with an abundance of hefty chrome hardware adorning each shell. This is comprised of 2.3mm triple-fl anged chrome hoops, Natal's own 'Sun Lugs' with 'True-Tune' tension rods, 'Tri-Throw' snare strainers, 20-strand snare wires and a die-cast Natal sun logo badge for each drum. Combined with the sheer bulk of the ¾"-thick wooden staves, they are incredibly weighty but also feel decidedly sturdy; like they could take a serious beating. Most noteworthy in terms of the build is of course the use of a stave manufacturing process versus the more typical ply-wood. According to Natal, "While ply is a very effective material for making snare drum shells, it does not have the freer, more musical, resonance of stave. Also, stave-constructed shells use less glue, allowing the resonant waves to vibrate more intensely." This method also creates a vertical wood grain which is designed to create even further resonance. On examination of the outer shell, the smooth joins in the wood visibly help to create a unique display of the natural, vertical wood grain. Upon inspecting the inner shell, it becomes easier to see the tremendous craftsmanship that has gone into constructing these drums. It is possible to see the jig-saw like joints of each piece of wood within the precision cut bearing edges. Unlike the outside of the shell which has been cleanly lathed and sanded to create a smooth fi nish, the inside has been left untouched, allowing the natural curve of each stave to be seen. First up is the 5½" maple and this snare certainly lives up to expectation on the resonance front. The lightest fl ick aimed at the centre of the batter head produces a long, high-pitched ring from the drum's shell. It quickly becomes clear at this point that this is going to be a lively drum! With a stick in hand, the ringing is ever present but is now balanced by a focused attack. A spot of dampening helps tame the overtones and promotes a bellowing crack. The rimshot, though, is where the magic really happens. Unleashing the power produced by the thick staved wood, a tremendous backbeat is produced that could drive the heaviest of rock bands. The drum also creates a beautifully woody cross-stick tone that is able to cut through the mix. 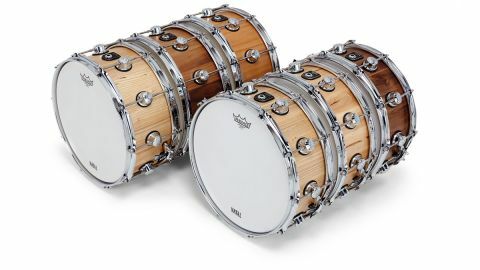 "Easily our favourite of the six, the walnut snare brings a touch of class in both appearance and musicality"
Naturally, the 6½" maple shell is slightly lower-pitched than its shallower counterpart, lacking in the shorter snap of the rimshot, but bringing to the table more depth of tonality and a slightly longer note. The ash snares not only look beautiful but sound it too. They produce a drier attack which is easier to manage and provide a more mature characteristic than the maple. With additional sensitivity under hand, articulate ghost notes are produced with minimal effort yet there is still plenty of weight in the backbeat. Easily our favourite of the six, the walnut snare brings a touch of class in both appearance and musicality. With the 6½" model placed on the stand, we are instantly smitten. Given its naturally darker tone, the drum springs into life at even the lowest of tunings - absolutely spot on for that classic Gadd-style beefy backbeat. With a few extra key turns, the drum comes into its own - each stick-hit commanding a highly resonant and warm yet focused sound from the staved walnut shell. Like the ash, ghost notes are well pronounced and there is an enormous dynamic range at hand. Even with the supplied single-ply heads and triple-fl anged hoops there is still a focus in the sound and plenty of weight in the rimshot of each of these drums. A thicker head would help to control the abundance of natural overtones and would almost certainly make them easier to tune. Natal's notched 'Tri-Throw' snare strainer and the 20-strand snare wires are a strong pairing. The ability to throw the wires into a looser middle setting for a quick tonal change works wonderfully in theory, but adjustments on the fl y are a little fi ddly and it takes some work to get from the loose setting to 'off' in a hurry. This could just be sausage fi ngers on our part though, so it is recommended that you try it for yourself! With the resonant qualities of these drums, it would be exciting to see plans for a piccolo version at some point in the future.